The state of the steel industry in Karnataka can make a good case study on the new risks facing Indian industry. Steel companies were not the ones doing illegal iron ore mining, damaging the region’s environment, but have been worst affected in the mining ban’s aftermath. 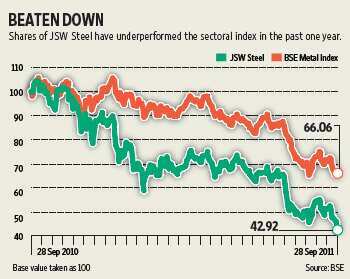 JSW Steel Ltd is a key affected party. On Monday, it announced it is slashing its steel production in Karnataka to 30% of capacity. On Tuesday, the company’s management voiced the possibility of closing the plant. The stock did not react much to the first announcement, falling by only about 1% on Tuesday, but the second one spooked investors, and its share price fell by 6.6% on Wednesday. This is a surprising turn of events from August, when the firm had applauded the Supreme Court’s order allowing NMDC Ltd to continue mining ore for domestic supplies. Existing iron ore stocks in the state were also to be auctioned. JSW Steel had then announced it would run its plant at 80% utilization. The price discovery in auctions and delays in ore supplies appear to be the main stumbling blocks for JSW Steel. Earlier, iron ore stocks were to be sold by e-auction, but now the auctions include NMDC’s new ore supplies, too. The first round of auctions apparently saw under one-third of the stock remaining unsold due to over-pricing of low-grade ore. In any auction, the price realized will be closer to the spot market rates, and depending on available lots, can also be volatile. This volatility will, in turn, be transmitted to JSW Steel’s cost of production. It would instead prefer to buy some stocks from the auction, and the rest from NMDC at long-term contract rates. That would put it on equal footing with other large steel producers, and also allow it to price its own long-term steel contracts accordingly. JSW Steel’s alternatives are to buy ore from other states, or if that is not viable, cut back steel production. It appears to have decided on the latter, unless the situation changes. So, what does this mean for the company? Its steel production getting affected was known, but the extent is a surprise. It had expanded capacity, so production is still higher. Thus, in August it operated at 75% utilization, but crude steel production rose by 23% year-on-year; in July, output rose by 15% despite a cut in production. Chances are it may end the September quarter at reasonable levels. The next quarter is not certain, however. But domestic steel demand is also slowing. So JSW Steel’s sharp uptick in production may leave it with inventories to sell in forthcoming months. It may try to ramp up production at its other units, and at JSW Ispat Steel Ltd.
Steel prices are firm, partly because of stiff raw material prices, and now also because of a weaker rupee. Rising prices will provide some cushion from the impact of low utilization on margins. The next trigger will be the e-auctions of ore, to be held on Thursday. If JSW Steel gets its required quantity, and at prices it deems reasonable, it may calm nervous investors. But if it does not, its share price may remain volatile.